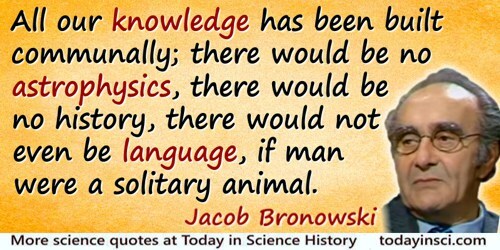 All our knowledge has been built communally; there would be no astrophysics, there would be no history, there would not even be language, if man were a solitary animal. What follows? It follows that we must be able to rely on other people; we must be able to trust their word. That is, it follows that there is a principle, which binds society together because without it the individual would be helpless to tell the truth from the false. This principle is truthfulness. In Lecture at M.I.T. (19 Mar 1953), collected in 'The Sense of Human Dignity', Science and Human Values (1956, 1990), 57. In De Architectura, Book 1, Chap 1, Sec. 2. As translated in Morris Hicky Morgan (trans. ), Vitruvius: The Ten Books on Architecture (1914), 3. Our belief is not a belief. Our principles are not a faith. We do not rely solely upon science and reason, because these are necessary rather than sufficient factors, but we distrust anything that contradicts science or outrages reason. This is true of all science. Successes were largely due to forgetting completely about what one ultimately wanted, or whether one wanted anything ultimately; in refusing to investigate things which profit, and in relying solely on guidance by criteria of intellectual elegance. … And I think it extremely instructive to watch the role of science in everyday life, and to note how in this area the principle of laissez faire has led to strange and wonderful results. Address (Jun 1954) to Princeton Graduate Alumni, 'The Role of Mathematics in the Science and in Society', in Collected Works: Vol. 6: Theory of Games, Astrophysics, Hydrodynamics and Meteorology (1961), Vol. 6, 489. As quoted in Armand Borel, 'On the Place of Mathematics in Culture', in Armand Borel: Œvres: Collected Papers (1983), Vol. 4, 422.